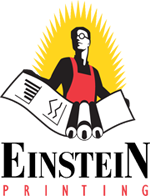 Einstein Printing proudly serves the Carrollton, Dallas, and Addison areas of Texas. Whether you are a corporation, a small business, a start up, or somewhere in between, the quality and diversity of services available from Einstein Printing makes us the easy choice in today's competitive world. We would really love to discuss your next design or print project with you, so why not give us a call today? Corporate Identity Packages near you! Einstein Printing is a commercial printer based out of Carrollton, but providing their services to Dallas, Carrollton, Addison, Farmers Branch and beyond! We've been offering Corporate Identity Packages, Brand Development and Branding Material services in the DFW metro area for over 30 years! What you receive in our Corporate Identity Packages vary widely from client to client. The only really consistent elements occurring in our packages are two pieces of information: Your company name and logo. Why work with a professional print design company? We've all seen a company logo or piece of marketing material and thought to ourselves, "How did anyone think THAT was a good idea?!" The unfortunate truth is, not everyone has a good design aesthetic, and even people who are very artistic don't necessarily have the design experience or technical know-how to bring their vision to life. Everything from making sure the design is centered properly to making sure the corporation's name is readable and the font isn't too large is made easy by hiring a professional. Forget lopsided banners and being unable to find the right picture file - a professional print design company makes everything flow smoother. All you need to worry about is making sure we have the correct files. We'll make sure everything goes right - from the design fitting on the products to making sure the designs print correctly and that there are enough for each event.